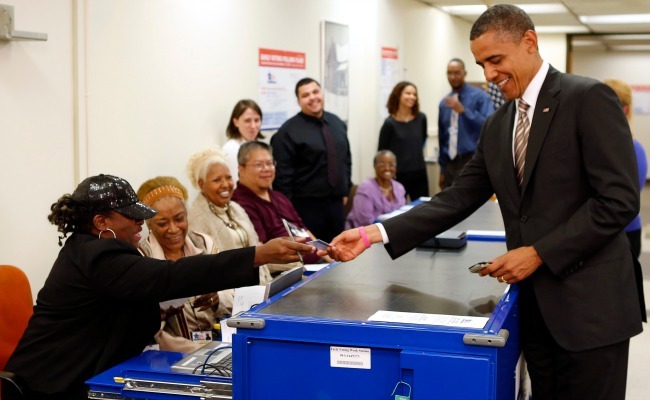 Even Barack Obama Has to Show an ID to Vote—Is That So Bad? Voter-ID laws have the left apoplectic, are usually unnecessary, and can hurt some voters. But not all laws are the same, and the risk has been exaggerated. Not surprisingly, Bill Clinton had the best line. At the 50th anniversary of the March on Washington last month, the former president said from the steps of the Lincoln Memorial: "A great democracy does not make it harder to vote than to buy an assault weapon." Clinton knew his audience and how hot this issue is right now. Voter-ID laws are facing legal challenges all over the country. And now the Obama Justice Department has gone to court to try and stop Texas from implementing its voter-ID law. When the Democratic-led executive branch tries to undo the law of the nation's second-most populous state -- and a red one at that -- it is, as Clinton likes to say, a big deal. And while it's hard to argue with his quip about assault weapons, the problem is that the whole debate over voter-ID laws is more complicated than the left or right would like to admit. On the left, voter-ID laws are being dismissed as the second coming of Jim Crow. Attorney General Eric Holder, in his less-than-nuanced style, likened them to the tools of segregation. On the right, they're being hailed as common-sense measures to prevent ballot fraud and keep elections fair and honest without discriminating against anyone. Both are wrong, although there's no reason to engage in false equivalence: The right is more wrong than the left. First, voter-ID laws generally represent an answer in search of a problem. There just isn't much evidence of voter fraud. Any number of reputable analyses suggest that ballot fraud of the kind where John Smith goes into a polling place and tries to vote three times is extremely rare. Rick Hasen, a law professor at the University of California-Irvine and one of the sages of American voting laws, hasn't found a single election thrown by ballot fraud since 1980. In 2007, The New York Times noted that a five-year effort by the George W. Bush Justice Department led to only 86 convictions. That's not nothing, but it's miniscule compared with the tens of millions of ballots cast during that time. There's much more potential for electoral fraud from people voting in two states, say where they have a vacation home or are students, rather than people going into a booth and pretending to be someone that they are not -- a problem that voter-ID laws wouldn't help stem. If the United States used a biometric ID card like the kind America promotes in foreign elections, it'd be possible to prevent that potential for abuse. The rash of recent voter-ID laws are coming from states with Republican governors and legislators, many of them taking advantage of the recent Supreme Court ruling on the Voting Rights Act. Before the ruling, the Justice Department's "preclearance" process kept those laws at bay. Now states are racing to pass these laws that seem to have the effect of keeping Democrats from the polls. North Carolina has the harshest voter-ID law. And it's probably no coincidence that the bill also cut a week off early voting in the state and eliminated both same-day voter registration and preregistration of 16- and 17-year-olds in the high schools. Texas, which also went gonzo after the Supreme Court ruling, has a voter-ID law that allows you to use a concealed-carry permit as ID but not a student ID. Civil-rights groups have been apoplectic about these laws, saying they are discriminatory. And they would seem to have a pretty good case, as there's no fraud epidemic and those who would have the hardest time complying with the law are poor and minorities. That's because minorities and the poor are much less likely to have the kind of government-issued photo IDs that some states require. For instance, the Brennan Center at New York University found that in the states with the most-restrictive voter-ID laws found that 11 percent of eligible voters didn't have a qualifying ID and getting one wasn't easy. Offices were often far away and their hours were spotty. In Alabama, almost a quarter of the voting-age citizens without access to a vehicle lived more than 10 miles from a government office that issued an ID. In other words, the left is right when they say this can be a real obstacle. The problem for the left is that not all voter-ID laws are the same. Conflating them into one ugly mess is simplistic, even disingenuous. Consider how we got here. A 2008 Supreme Court opinion written by the liberal Justice John Paul Stevens upheld an Indiana voter-ID law, rejecting the arguments from the left that such photo-ID laws were tantamount to disfranchisement. The Court didn't say that every voter-ID law would always pass judicial muster, but it certainly gave the green light to states -- and many followed. The Justice Department and civil-rights groups will argue in court that the Texas-style voter-ID laws are discriminatory under the Constitution and the sections of the Voting Rights Act that are still standing. But the left might be better off acknowledging that not all voter-ID laws are onerous. The president's liberal home state of Hawaii has one. In Louisiana, there's one that's stirred little controversy. That's because the best ones allow a wide range of forms of identification and, if that's not available, allows the person to sign an affidavit stating that they are who they say they are. "This has become a very potent issue for the left in terms of fundraising," says Hasen, who has been critical of recent harsh measures such as North Carolina's while acknowledging that others work better. Indeed, a 2005 report, following the Bush-Gore Florida recount, looked at the problem of voter-ID laws. The panel, co-chaired by Jimmy Carter and James Baker, concluded that voter IDs could be used well and weren't necessarily discriminatory (although Carter himself seems to have backtracked; he took a swipe at voter-ID laws at the March anniversary, too). Robert Pastor, who was executive director of the Commission on Federal Election Reform, says "it's very sad" the way that both sides have hyped and exaggerated the voter-ID issue. The solution, he says, is for Democrats to accept that voter-ID laws are a reasonable tool and for the country to move toward national biometric cards. Alas, that's not likely to happen anytime soon, and so states will keep fighting this battle and courts will keep litigating it. The hurdles for biometic identification, as with so many issues, are financial and political. Financially it'd be expensive to outfit all Americans with that kind of ID even if it would solve a host of problems, not just in terms of voter identification but also immigration. But the price tag is high. A report from the University of California-Berkeley School of Law estimated that it would cost $40 billion to get it started and $3 billion a year to maintain. And the enemies of that kind of system would kill it before cards ever got into anyone's wallet. Between the ACLU on the left and the sovereignty crowd on the right, it'd be shot down quicker than you can say "Rand Paul." Pastor acknowledges that this "intense minority" has veto power. A vision of a happier future might have come in October when President Obama walked into his Chicago polling place to cast an early ballot vote for his own election. Laughter erupted when the poll worker asked for his ID, a requirement for early balloting. "You're right," the president replied and told her to ignore the earlier picture without so much gray hair. The best voter-ID rules, like those of Illinois, allow people to present a wide variety of IDs -- including a paycheck and a utility bill -- and make sure they can vote as easily as the president did.